Minds Eye Entertainment recently send us information for their upcoming release "The Humanity Bureau". The film stars Nicolas Cage, Sarah Lind and Hugh Dillon. "The Humanity Bureau" will be released in standard theatrical theaters, Barco Escape format theaters and Premium Video On Demand (PVOD) on April 6th. For more information on this film, you can visit the film's official website at: http://www.thehumanitybureau.com/. 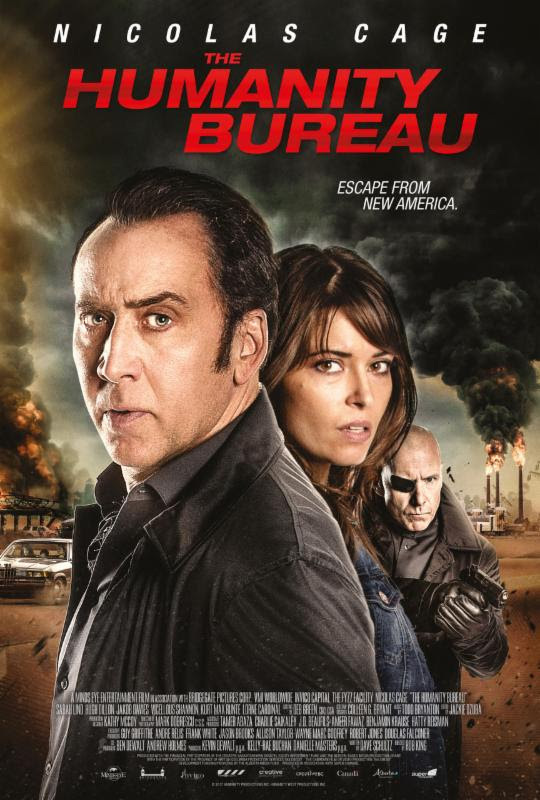 The Sci-Fi Action Thriller, The Humanity Bureau, starring Nicolas Cage, is set to release in standard theatrical theaters, Barco Escape format theaters and Premium Video On Demand (PVOD) on April 6, 2018. The film’s debut will be complimented by the release of a standalone episodic Virtual Reality (VR) series titled “The Humanity Bureau VRevolution,” which will be available for download across all VR platforms on March 2, 2018. “We shot the film in three different formats, including standard theatrical, 3-screen Barco Escape theatrical, and cinematic virtual reality to provide multiple avenues for audiences to engage with and experience the story’s universe," said Producer Kevin DeWalt. “We hope to give viewers more options for alternative content within today's new media.” The story is set in the near future with global warming wreaking havoc in parts of the American Midwest. In its attempt to take hold of the economic recession, a government agency called The Humanity Bureau exiles members of society deemed unproductive and banishes them to a colony known as New Eden.